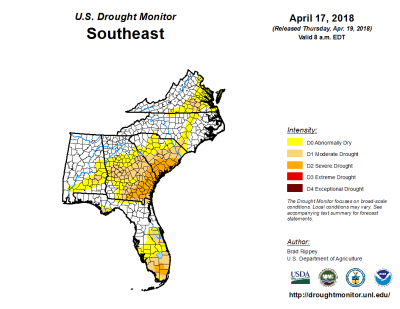 “A cold front sweeping across the Southeast from April 14-16 produced heavy showers and locally severe thunderstorms. 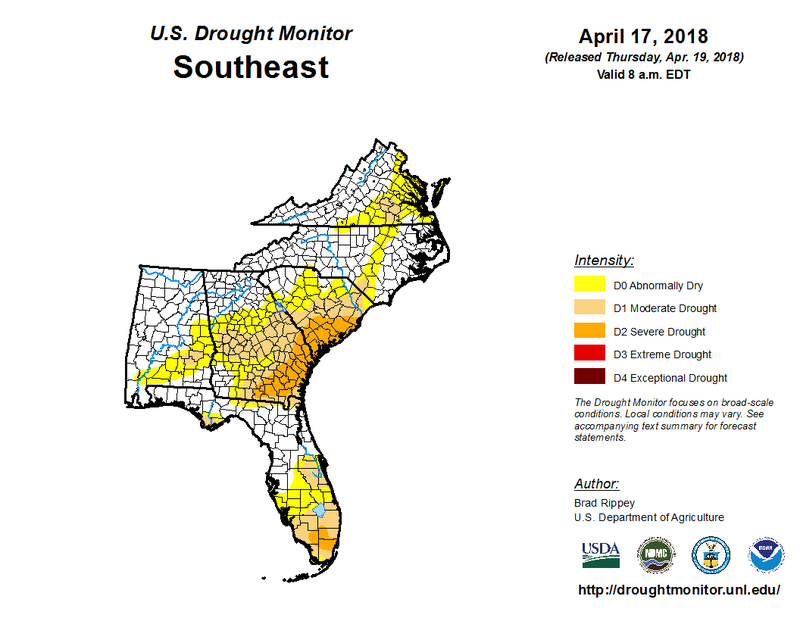 As a result, there were substantial reductions in the coverage of abnormal dryness (D0) and moderate drought (D1) from Alabama to Virginia.” Drought Monitor (April 19, 2018). * Seventh District- Chicago– “Income prospects for the agricultural sector improved a bit during the reporting period, in spite of concerns about the impact of Chinese tariffs. Corn and soybean prices moved higher (helped by weather concerns in Argentina) and allowed farmers to lock in modest profits for at least a portion of their crops this year. * Tenth District- Kansas City– “In the Tenth District, farm income and credit conditions remained weak, and the short-term outlook for the agricultural sector has been influenced by 2018 crop production expectations and drought. Approximately half of winter wheat acres in Kansas and Oklahoma were rated as poor or very poor due to abnormally dry conditions. “Corn production was expected to remain unchanged or decline slightly in all District states. After very strong growth in 2017, production of soybeans was expected to remain relatively unchanged in most states, while cotton production in Oklahoma was forecasted to continue to expand due to higher prices relative to other crops. Lower production expectations for corn, soybeans and wheat supported slightly higher prices. On Wednesday, the Federal Reserve Board released its April 2017 Beige Book update, a summary of commentary on current economic conditions by Federal Reserve District. The report included several observations pertaining to the U.S. agricultural economy.